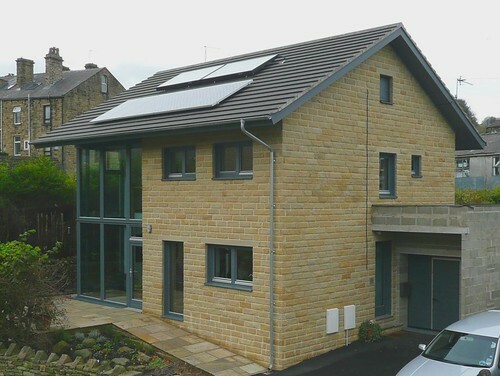 generous overhangs on the roof of the Denby Dale PassivhausSee more on the Passivhaus standard. The PassivHaus Institute has pioneered a standard for low energy buildings. It includes very low energy usage and ways of achieving this. The word is derived from the idea of buildings which are fundamentally low energy and passive solar heated rather than using extra gadgets to heat them. See Passivhaus for the UK branch of the organisation. Simply because most rain in the UK falls within 5º of vertical, a generous overhang will prevent most rain reaching the walls. This will prevent most rain reaching window frames, especially if they are set back slightly into the wall. In the case of timber frames, this can extend their life very considerably. While this costs slightly more initially for the extra roof area, it does save money in the long run and usually adds to the style of the house, in turn making it more valuable. Roofing materials should be checked for embodied energy and for how polluting they are in manufacture. For instance most of the natural stone slates coming into the UK at present are coming from India and China. Lead for flashings is often manufactured in a very polluting way. This subject is dealt with well in the Green Building Handbook. There is a potential pollution problem from zinc roofs. With only the minimum of filtering, collected rainwater can be used for watering the garden, washing the car, the cold feed to the washing machine and flushing toilets. Particularly in parts of the country where water is becoming increasingly scarce, the low investment required for the first two of these makes a lot of sense. 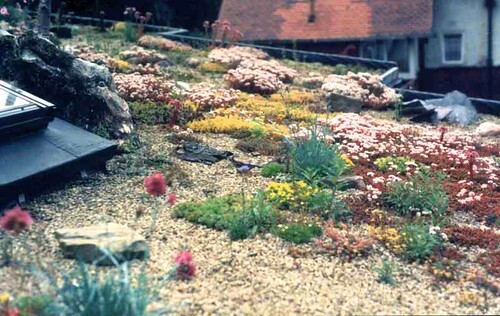 Bear in mind that a living roof, (see below) is not an ideal candidate for collecting rain as it tends to absorb quite a lot itself, particularly during dry periods when you need it most. The increasing areas of hard surfaces in towns such as paths, driveways, roads, hard standing, etc. put a very high strain on the sewerage system in most towns. This is because when it rains there is sudden runoff into the drains rather that gradual seepage into the earth. SUDSSustainable urban drainage systems guidelines on how to prevent this are on the CIRIAConstruction industry research and information association Susdrain web site (registration is free). One of the ways is to have a living roof (see below). Research has been going on at Cranfield University into the possibilities of rooftop cleaning up of grey water for use in flushing toilets. The result is GROW by Waterworks UK Ltd. The Building RegulationsThese are the mass of regulations that cover safety, health, welfare, convenience, energy efficiency etc. in the way buildings are constructed. Not to be confused with Planning consent (which is more to do with whether you can put up the building in the first place). See more on the regulations have two categories of roof covering: jointless (or with sealed joints) and overlapping dry joints. The former (typically a plastic membrane) can act as a ‘stand alone’ covering whereas the latter requires a secondary layer of protection behind the top layer. This is typically where you have tiles or slates with a layer of vapour permeable sarkinga waterproof layer in a roof which acts as backup protection in case the main layer fails. Usually a membrane or board and usually situated between roof laths and joists. behind. The sarking (usually felt or non-woven plastic membrane) catches any water which might get past the slates and runs it out to the eaves. In England the sarking is usually stretched between roof joists whereas in Scotland it is required to be laid on a layer of sarking boarding because of the increased exposure levels to wind and rain. Dwellinghouse does not include a flat or a building containing a flat. purposes (including; for the purposes of Part B of the Approved DocumentsApproved documents (England) are detailed publications which come under the English Building Regulations. They are based on tried and tested methods of building and if you follow them you are assured of complying with the Regs. The equivalents for Scotland are the Technical Handbook, for Wales: the Approved documents (Wales), and for N.I. the Technical Booklets in the Building Regulations, a kitchen, but not a bathroom). then the insulation can simply be at ceiling level whereas if it is habitable then insulation is required within the thickness of the roof covering. See ‘How much Insulation? If it is a flat roof then the insulation will have to be within the roof thickness and there is a choice about whether to have a ‘warm’ roof or a ‘cold’ one. Whichever the case, the amount and type of insulation will be determined by the SAPStandard Assessment Procedure - the method used in the building regulations for calculating the energy use of a house. calculations for the whole building. Bear in mind that the roof is normally the easiest and cheapest place to increase insulation levels. It may be worth considering the effects of decrement delayThis relates to the lag time that insulation itself takes to heat up or cool down. It introduces a delay into the effect of the insulation. This can help level out peaks and troughs of temperature. See the section on Decrement Delay on roof mass and insulation. If a roof is to be part of a habitable area then it may be important to provide some degree of sound insulation against such such things as street noise[for the purposes of part E of the Approved Documents] - Noise is unwanted sound., aeroplanes etc. Sheltering roof is not so much about physical shelter as the feeling of shelter, especially when rooms are visibly built into the roof and eaves come down close to the ground. Roof layout. This pattern in the book is a detailed examination of how various parts of a roof interact and it is quite relevant to several aspects of green design. Flat roofs first came into vogue in the UK as a result of the Modern Movement around the 1930s. Purity of shape, form, materials etc. was everything and a flat roof was seen as a pure, minimal expression of shape. The Modernist style never took a grip of the British imagination in the same way it did in much of the rest of Europe. People preferred to hark back to a romantic past, preferably Arts and Crafts, which was itself a harking back to some previous golden age. flat roofs are an interesting subject because they can express a certain sort of character to a house, which is not always to the liking of the Great British public. They can also be the basis for some kind of a roof garden. They can occasionally be useful on extensions if a sloping roof would block off a window or obscure a view. And they can leak! These kind of rooftop gardens need not be confined to new buildings. It is a relatively simple job to incorporate such outdoor areas into traditional pitched roofs as in the simplified diagram on the right. In this case the flat outdoor area is cut back into the roof and has little visual impact from ground level and therefore the planners give less grief. Of course there are several important considerations from the Building Regulations point of view. The whole area has to be treated like a roof. The floor has to be properly drained and have a wearing surface which will not be damaged by the odd bit of over enthusiastic gardening. It must also be structurally up to the job and properly thermally insulated from the room below (and possibly acoustically). The flanking walls have to be treated as external walls and guarding is necessary to prevent falling etc. But what a nice spot for a bit of sun bathing. Extensions and modifications are constantly being made to houses and this often involves changes to roofs. (see Lifetime homes ). Especially with major extensions the junction between an existing roof and a new one can be quite problematic unless some thought has been given to it at the original design stage. For instance, possibly one of the worst outcomes is the creation of a valley between two adjoining roofs in the proximity of trees. The valley gutter is quite a challenge to construct well anyway (especially where condensation on the underside might be a problem) and is prone to blockage due to accumulations of leaves etc. This creates leakages down the inner wall rather than simply an overflowing gutter which is the normal case at the eaves. It is quite common to see farm house extensions with this configuration. Conservation of Fuel and Power (Part L of the Regulations) concerns energy saving and it distinguishes between new dwellings (part L1AThe Approved documents, (England) part L1A, deals with Conservation of fuel and power in new dwellings.) and existing ones (part L1BThe Approved documents, (England) part L1B, deals with Conservation of fuel and power in existing dwellings). The Single Ply Roofing Association produces a design guide for single ply roofing with lots of useful information.